One of the places where people get stuck most of the time is in the beginning. It’s hard to be completely clear and comfortable about where you want to go. But the truth of the matter is that you have to start in order to get somewhere. If you’re spinning your wheels trying to get things perfect before you launch, you probably won’t get very far. And if you are in this situation now then you know exactly what I’m talking about, don’t you? 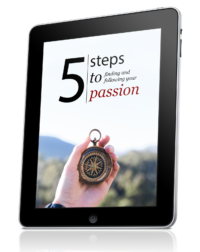 In this article, I’ll show you five simple steps you can take to jumpstart your passion business even if you don’t have a clue where you want to go or what your passion is. The good news is that you don’t have to know where you want to go in order to start. And the funny thing is that usually when you start, things will start falling into place piece by piece, but it doesn’t happen until you take the puzzle out of the box and begin. The first step you take is to find a topic that you’re interested in and that is profitable. What I mean by profitable is that it has to be a market where people are willing to pay for solutions. For example, there are people looking for tips on how to take care of a guinea pig. Now that’s a niche if there ever was one. And you also don’t have to worry about making your first passion business an outrageous success. What you should be focusing on is learning the process and taking action. Don’t worry about making mistakes, because everyone makes them, and it’s how we learn. Focus on moving forward and seeing what happens. Become curious about all the possibilities that await you. The next step is determination. You will run into a lot of obstacles and fears on your path to building your passion business, which is why you need to be determined to succeed. It wasn’t until I became determined that I finally started looking at what I was doing wrong, and I opened myself up to feedback and constructive criticism. This is how I learned, and this simple choice made all the difference in my early success. And it is what will make all the difference in your success. You can succeed, and you can build your passion business, if you only decide to make it happen. You and I both know that focus is an essential ingredient in getting paid to do what you love. The problem is that there are so many distractions out there that it can be tough to stay on the right track. However, when you’re determined and you love what you’re doing about, it will be much easier. The best way to stay focused is to constantly ask yourself what the next step is that you can take now. Keep focusing on what you can do right away, and you will reach your goals. The fourth step is to get feedback. When I began succeeding online, I got coaching and I got feedback on what I was doing. This showed me very quickly what I was doing wrong and what I could improve. If you can get a coach or buy a good training course, then by all means do so. Most people have excuses. They might say that they don’t have money, while at the same time watching cable television all day and eating out once a day. That’s not an excuse, that’s a choice to not go after your passion. 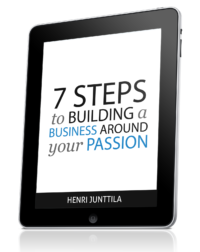 In my experience, I’ve found that having a blueprint and a step-by-step process to follow when you build your passion business makes everything so much easier. For me it meant that I didn’t have to figure everything out for myself, which allowed me to just focus on taking action and making things happen. And before I wrap this article, I want to let you in on the fact that I can help you build your passion business from scratch, if you’re interested. To learn more, check out Lifestyle Liberation Academy. It contains everything I’ve learned during the last 4-5 years of building my own online business. There’s no fluff. Only the best, and proven strategies that truly work. And the best part? You’ll have to check it out to find out ;). Great tips, Henry. I SO agree with just getting started, whether or not you’ve figured it out. I’ve started so many times it is crazy, but with each attempt, I learn more, I become more. I say just have fun with it! The great thing about building these niche sites is that you can test which topic works and which doesn’t. For example, I have many interests that I would like to pursue and building a niche site around it, I can test if I can keep up with creating content and if I’m are willing to learn more about the niche you enter. If I find a winner, I can turn that more and more into a authority site and focus solely on that one. In fact, this way I learned that the first niche I entered to was exciting at first, but now I have lost fully my interest around it. I know that it is time to move to another niche (and passion). Also, I like to create my own blueprints out of the blueprints that are provided. By that way I can tweak it further, fine tune it and see, which points can be automated or outsourced. Great post…and for me,it’s come at just the right time. Thanks for the nice post. “The Zone,” getting to that “very special place” [ via intense focus] could be a column idea you may wish to give thought to. Great tips Henri. You are so right about needing to just get started. When someone tells me that they want to earn extra money, but don’t know where to start, I usually tell them to just set a goal to earn $300 (a car payment). Start trying different things to earn $300 a month and once you start dabbling in entrepreneurship you start figuring out more and more ways to earn money. I really enjoy reading your posts. They are very informative. It’s already online. You can read it by clicking here.